Strong individual performances on Saturday, Feb. 3, during sectional wrestling at Southeast Warren sent four Hawk grapplers to districts. Overall, the team placed sixth with 88 points. 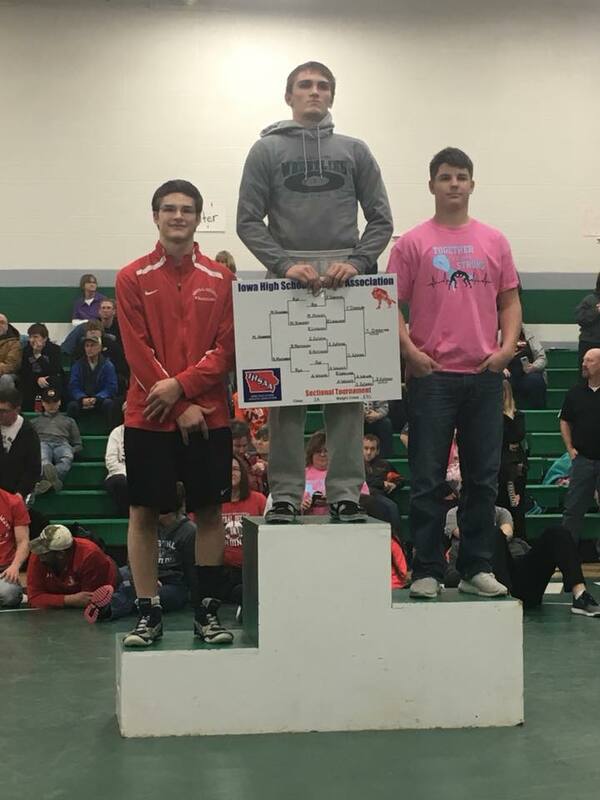 Senior Josh Dunsbergen earned sectional champion after three hard-fought matches at 138 pounds. Dunsbergen captured his first win of the day with a pin at 2:34 over Wayne’s Wyatt Boggs. He went on to face Tanner Dierking of Southeast Warren/Melcher-Dallas. Dunsbergen pinned Dierking with just one second left in the first period. In his final match of the day, he triumphed over Tyler Strasser of North Mahaska. The grapplers fought all three periods, but Dunsbergen came out on top, 5-2. This was a sweet victory for Dunsbergen as it evened out the wins between the two wrestlers throughout the season. 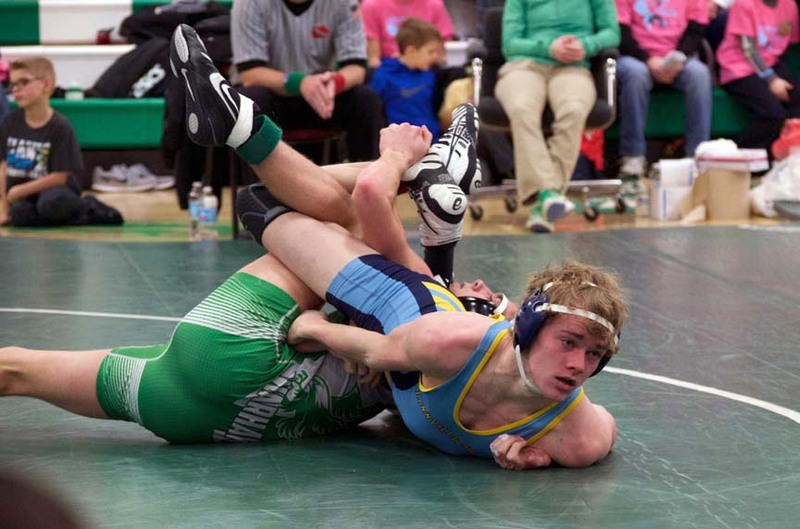 Freshman CJ Snethen holds down his Wayne opponent at sectionals last Saturday at Southeast Warren. Snethen placed second at 120 pounds. Freshman CJ Snethen, at 120 pounds, captured second after a 2-1 day. A first-round bye was followed by a pin over Logan Jones from Central Decatur at 5:48. Snethen suffered a loss to Trent Tyrell of Wayne and finished second. 152-pound senior Cayden Johnson started his day off with a bye and went on to win against Hunter Clark of Wayne in overtime, 10-8. 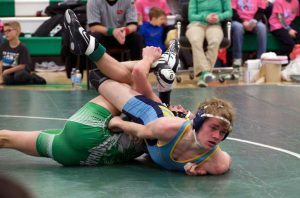 Johnson fell to Alex Henderson of Southeast Warren/Melcher-Dallas in a battle for first and was awarded second. 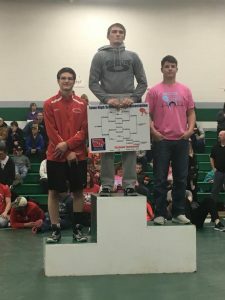 Senior Sage Zylstra, at 170, was the final L-S wrestler to make it to districts. Zylstra quickly flew past quarterfinals, pinning Baxter's Brad Matthews in 20 seconds. He moved on to triumph over Adam Walker of Central Decatur by a 17-0 decision but fell to TJ Dierking of Southeast Warren/Melcher-Dallas. Senior Cayden Johnson (right) stands on the podium in second place at 152 pounds. Zylstra comments on the advancement, "It felt great to move on with the other guys. Now we have a week of hard work ahead of us to be able to get to the Well." 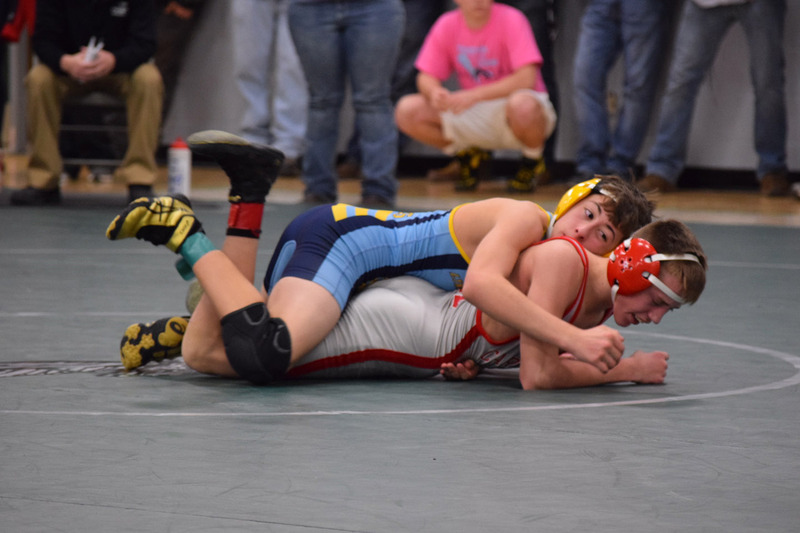 Ben Van Wyk, at 113, earned fourth for the day. The junior received a bye in his first match but fell to Wyatt Dale of Central Decatur in the semifinals and to Randy Jimenez of Southeast Warren/Melcher-Dallas in a battle for third. Sophomore Lane Mathis placed fifth after a fall in 1:19 to Tucker Babbitt of Moravia in his first match of the day. Mathis received a bye as a consolation match and was unable to get the win over Seth Chumble of Southeast Warren/Melcher-Dallas. Senior Carson Dunsbergen did not compete due to illness. 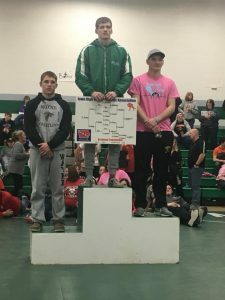 Noah Zylstra, an L-S senior, earned a spot on the podium in second place at 170 pounds. The four district qualifiers will wrestle in Pleasantville this Saturday. The top two in each weight bracket will move on to state. "We've had a great season so far, and I can't wait to keep it going." commented Dunsbergen. "I'm looking to make my last season one to remember." Senior Josh Dunsbergen grapples with Tanner Dierking of Southeast Warren/Melcher-Dallas.